Jean Carles (1892-1966) is a legendary French Perfumer. 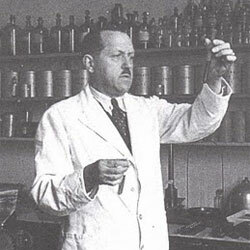 He was born in 1892 in France, and worked at Roure (now Givaudan) and founded the Roure Perfumery School in 1946. Even before serving as the schools first director, Jean Carles mentor great perfumers such as Jacques Polge and Monique Schlienger. His teaching theory is known as the "Jean Carles Method." He was the senior perfumer at Roure-Givaudan.